It was an opportunity that the Concordia Stingers women’s hockey team and head coach Julie Chu could not pass up. An elite goalie was in town and things weren’t going according to plan. Just off the plane from Calgary, Emerance Maschmeyer didn’t expect to stay in Montreal for very long. Acquired by Les Canadiennes de Montréal of the Canadian Women’s Hockey League in the summer from the Calgary Inferno, the 23-year old thought she would be part of Team Canada and leave for South Korea to compete in the Winter Olympics. Instead, she was called by the Canadian management staff and told she would be an alternate for the country’s Olympic preparation. Essentially, she would be on-call in the event that a goalie from the starting roster would get injured. The Bruderheim, Alberta native is the first to admit that she was not expecting to spend her winter season in Montreal. However, new opportunities popped up for her. Enter Julie Chu. As part of Les Canadiennes’ extended roster, once she knew that Maschmeyer would be coming over, she called to welcome her and to gauge her coaching interests. “I was more taking the chance to see if she had the time and availability to volunteer and help out with our team,” recalled Chu. With that in the back of her mind, Maschmeyer decided to accept Chu’s offer, putting the Team Canada disappointment behind her. 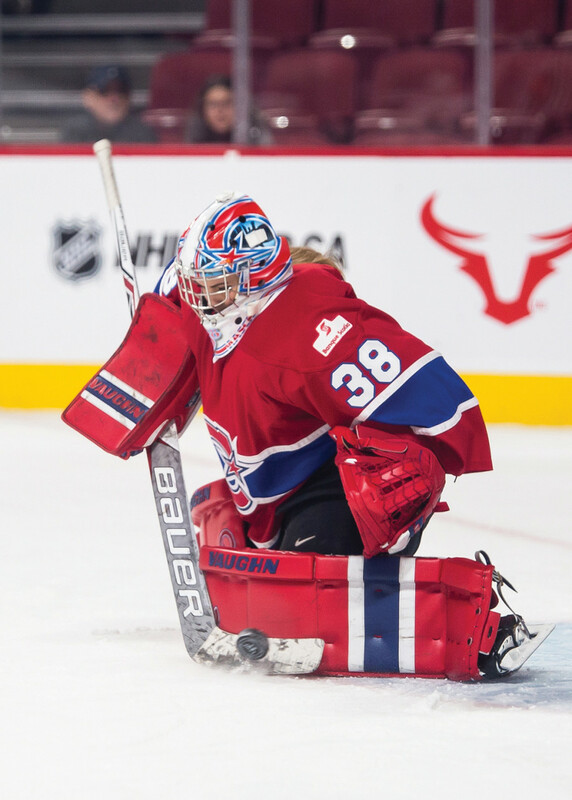 Instead of preparing for South Korea, she would stay in Montreal guarding the net for Les Canadiennes and helping other goalies do the same for the Stingers. It was a humbling experience in the young goalie’s career. In a true transition year, Maschmeyer isn’t dwelling on anything and takes her new responsibilities just as seriously as continuing to improve with a schedule she calls “a little unique, in a way.” In addition to her regular Les Canadiennes practices and games, she adds another weekly practice session for herself, on top of her coaching duties with Concordia. Having graduated from Harvard University only two years ago, Maschmeyer is still quite fresh off the “college experience” the players she now coaches are living through. She’s coaching players just as old as she is. This was exactly what Chu had in mind when she initially called her fellow, albeit younger, Harvard alumnus in the first place. “That’s something as coaches, when we get older and transition out of our playing days into our coaching days, not that you lose it, but you’re not as fresh in it,” said Chu. For Frédérique Labelle, a fifth-year goalie with the Stingers, it’s great to be able to relate to a coach with similar struggles but who doesn’t take her talents for granted, either. Labelle also enjoys the fact that Maschmeyer brings elements of her professional experience in the CWHL to Stingers practices. According to Maschmeyer, the goaltending position has been in constant evolution over the last ten years. With new techniques constantly becoming available, her approach leans toward sharing the wealth and receiving feedback from it. With the Stingers, Maschmeyer has the opportunity to say that she shares the goalie coaching job with Canadian goaltending legend and three-time Olympic gold medalist Kim St. Pierre. The two handle the primary goalie coaching responsibilities in practices on different days and behind the bench during games, but she admits having been starstruck when they met for the first time. Chu has a great tandem of goaltending coaches since it’s a position she admits is not her strong suit, Chu listens into both coaches from time to time, looking to draw from their expertise. “Kim was one of the most mentally strong goalies I’ve ever played against or been around,” said Chu. “Now we also have Emerance, who also has that edge,” ultimately being great role models for all the players. With names like Chu and St. Pierre along with other Les Canadiennes teammates Karell Emard, Caroline Ouellette and Cassandra Poudrier coaching the Stingers, Maschmeyer has a solid support system in Montreal. Heading to the mid-point of her transition year in the city, she’s looking forward to what is coming next.